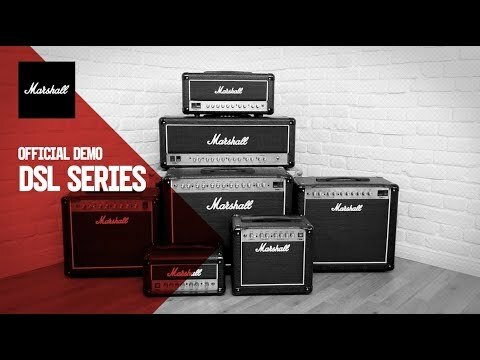 The Marshall DSL100HR 100-Watt Valve Guitar Amplifier Head is the ultimate gigging animal, boasting classic Marshall tones alongside contemporary features that make it an unstoppable force to be reckoned with. Since the first Dual Super Lead was released, the DSL series has held a special place in many guitarist's hearts, and the DSL100HR pushes the boundaries further than ever before. Each head is supplied with a PEDL-90012 footswitch and detachable power cable to get you up and running immediately. The DSL100HR is everything that you've ever wanted in an all-valve tone monster that bears the Marshall name. Packing a trio of ECC83 valves in the pre-amp, the DSL100HR generates that coveted high-gain overdrive that pushes your tone into the realms of legendary status. The power amp stage is home to an ECC83 valve and four EL34 valves that give this beauty the engine to crank out a ludicrously high output. The boffins at Marshall know that as awesome as it is to have 100-Watts at your disposal, sometimes the gig doesn't quite need that much power. Therefore, they've included a power reduction switch to allow the power to be dropped to 50-Watts, whilst still allowing you the valves to be pushed into that sweet spot. When you want to practise in peace, the 3.5mm jack output allows you to practise in silence via headphones. It even allows you to take a direct recording output with studio cabinet emulation crafted by the genius crew at Softube. The DSL100HR is equipped with two channels that include the Classic Gain channel offering old school JCM800 tones, and an Ultra-Gain that cranks up with heat. The Classic Gain channel has a Clean/Crunch button that allows you switch between transparent clean tones or a nice crunchy overdrive. The Ultra-Gain channel is equipped with an OD1/OD2 button, which takes you from an open, high gain overdrive to a mid-boosted tone with greater high gain potential. The included PEDL-90012 footswitch allows switching between panel modes on the selected channel for hands-free control during performances. There is also an optional 6-way footswitch available (PEDL-91005), which allows you switch between channels, modes, and more. The beautiful gold control panel is home to a wide-ranging EQ section, which offers the classic three-band Bass/Middle/Treble knobs that allow you to shape each bandwidth precisely. The corresponding Tone Shift button reconfigures the pre-amp mid frequencies when activated, which is perfect for easily performing a mid-range scoop that so many metallers love. The DSL100HR benefits from Presence and Resonance controls, which allow you to attenuate the higher and lower frequency content of your tone independently of the EQ. The built-in digital reverb allows you to lift your tone to suit your performance environment. There are Reverb Classic and Reverb Ultra controls, which each correspond to the Classic Gain and Ultra Gain channels. Across the rear panel you'll find a selection of connections that open up massive potential. There are speaker cabinet outputs for 16/8/4 Ohm loads, as well as an FX Loop Send and Return for connecting external FX processors. The Emulated-Out jack provides a line level output for headphones or connecting to a mixer. The emulated output has been designed using Softube-designed studio cab emulation. You can rest assured that your headphone/recording signal offers the utmost fidelity for practise or recording. The DSL100HR also offers a MIDI input for those who like to incorporate MIDI equipment into their live rig. Channels 2 (Split) "Ultra-gain" and "classic gain"